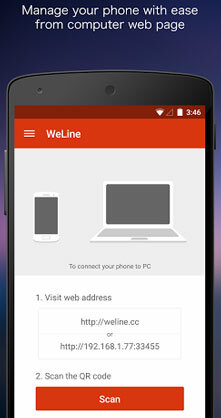 Exquisite, Simple and Fun, WeLine is a tool to connect your phone to PC wirelessly and seamlessly in a unique way. No need for cables, no need to install anything but a browser on your PC, and with free and unlimited remote data usage, WeLine is truly A ONE OF A KIND TOOL! Download now!
. Simple way to connect your phone to computer by scanning QR code. No cables!
. No need to have your phone and computer under same WLAN as long as both are online with internet access.
. Full access and management of phone resources including pictures, music, videos, documents, applications, files and folders.
. 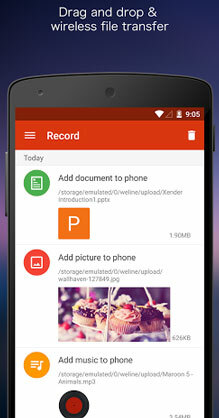 Supports management of phone SD card from your computer.
. Two way file transfer between phone and computer with high transfer speed under direct link mode.
. Play the music in your phone on your computer.
. Cast pictures from phone to computer and supports full screen display.